There are often occasions in history where shocking events have resulted in acts of kindness which cross international borders. This idea is symbolised by the connection forged between Manchester’s John Ryland’s Library and the University of Leuven (Louvain) Library following its destruction in World War One. The destruction of the Leuven library was an early tragedy of the war. 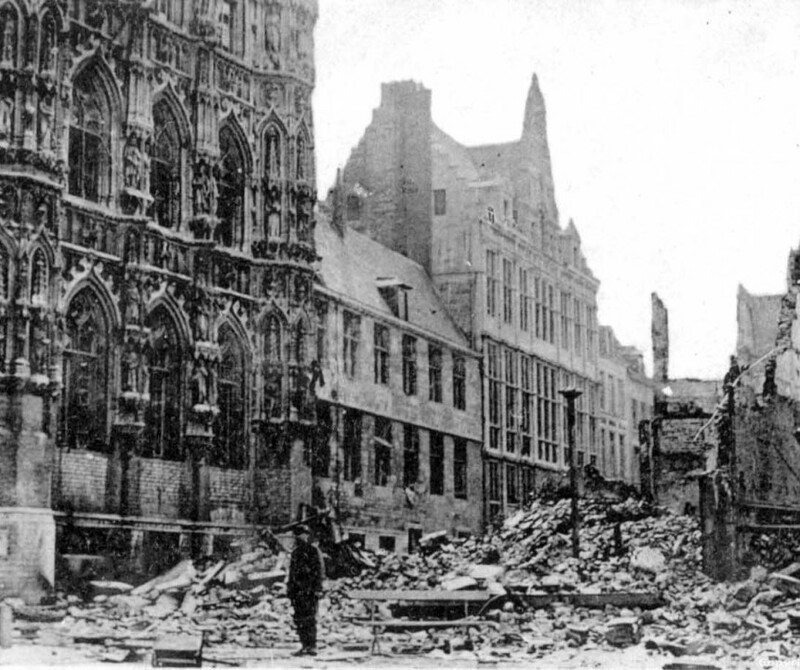 During the first few days of hostilities, whilst German forces were moving through Belgium on their way to France, troops occupied and ravaged the historic Belgian city of Leuven. The fourteenth century University Hall and the eighteenth century library wing of ancient manuscripts were devastated on the 25th August 1914, destroying three hundred thousand books and a thousand manuscripts. This was seen as a direct attack on learning and culture and caused outrage worldwide from international academic institutions. Henry Guppy used the Bulletin of the John Ryland’s Library to publicly appeal for donations of books from individuals and institutions across Britain. The response was substantial. By the end of 1915, 6,000 volumes had been collected or promised and the first consignment of books was sent over to Belgium in December 1919. The John Ryland’s Library acted as a clearing house for the donations that were made and by the time the appeal had closed in 1925, around 55,782 volumes had been collected. This effort was met with huge gratitude from the University of Leuven’s professors and Henry Guppy was invited to the ceremonial laying of the foundation stone of the new library in 1921, a project largely subsidised by the American government. Guppy was further presented, in 1924, with a few charred remains of the thirteenth century manuscripts that had been recovered from the library ruins as a token of their appreciation of his work. Sadly, the newly built library was destroyed for a second time by German forces during World War Two. However, despite this, the work of Henry Guppy and the John Ryland’s library remains to be highly significant in demonstrating the international war-time communitarian action and spirit, as well as illustrating the diverse contribution of the University of Manchester’s people in World War One.